Originating in South America, cassava is grown in over 100 countries around the world. It is the third most important source of calories in the tropics after rice and maize. Its caloric value, as well as its ability to tolerate dry conditions and poor soils, makes it a key food security crop in developing countries. As demand for food grows, there is an urgent need to increase yields in the face of such challenges as climate change, threats from pests and diseases and the need to make cultivation more resource-efficient and sustainable. 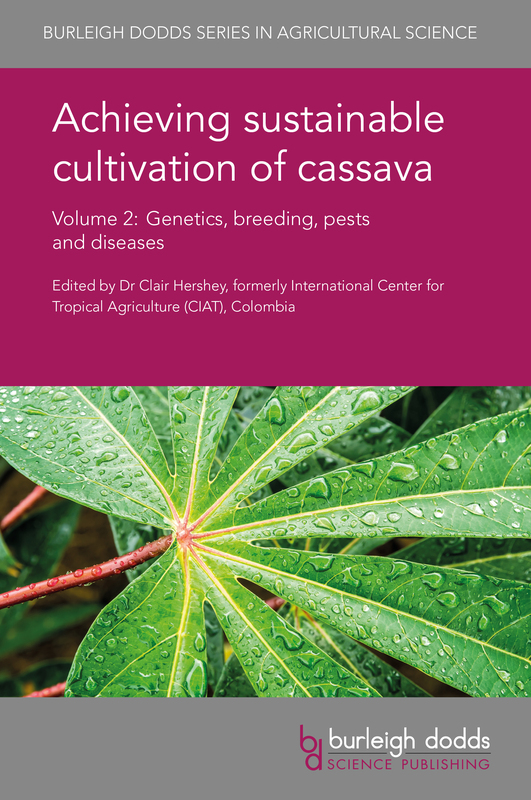 Drawing on an international range of expertise, this collection focuses on ways of improving the cultivation of cassava at each step in the value chain, from breeding to post-harvest storage. Volume 2 starts by reviewing genetic resources, advances in breeding and their application to produce varieties with desirable traits such as higher yield. It then goes on to review developments in understanding and managing pests and diseases. Achieving sustainable cultivation of cassava Volume 2: Genetic resources, breeding, pests and diseases will be a standard reference for agricultural scientists in universities, government and other research centres and companies involved in improving cassava cultivation. It is accompanied by Volume 1 which reviews cultivation techniques. "This book will provide a thorough state of the art on cassava research. The book benefits from bringing together professionals with a broad interdisciplinary expertise in cassava and a value-chain perspective in their writing. This book will be a welcome source of knowledge to facilitate the sustainable intensification of cassava farming globally."